Not all tents are created equal, something that avid outdoorsmen know all too well. So what is the best waterproof tent for keeping you dry when it’s pouring out? It depends on where and how you’re using it, but we’ll try to give you a heads-up on what to look for in our waterproof tent buying guide. Staying dry in the great outdoors will ensure that everyone has a great time! Here are some things you should know. 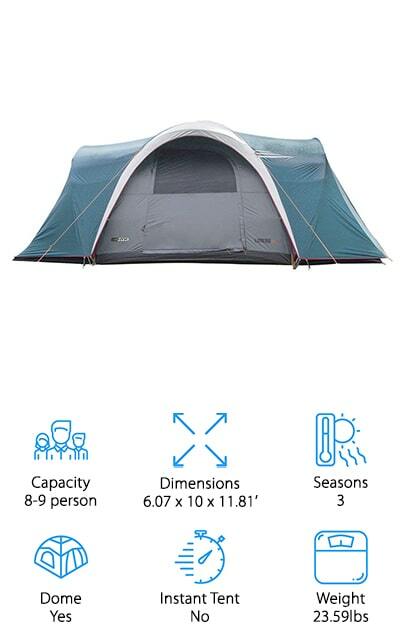 Capacity: This refers to how many people can comfortably fit inside the tent. Some tents measure this assuming that every person will have their own sleeping bag and generally doesn’t account for gear, pets, and other stuff you need room for. 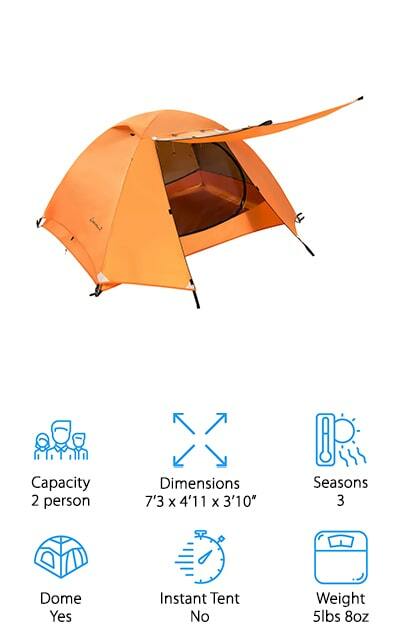 Dimensions: How big is the tent? When you’re looking at how many cots or air mattresses can fit inside the tent, this might be more useful than a capacity count. The size of the floor is crucial information. 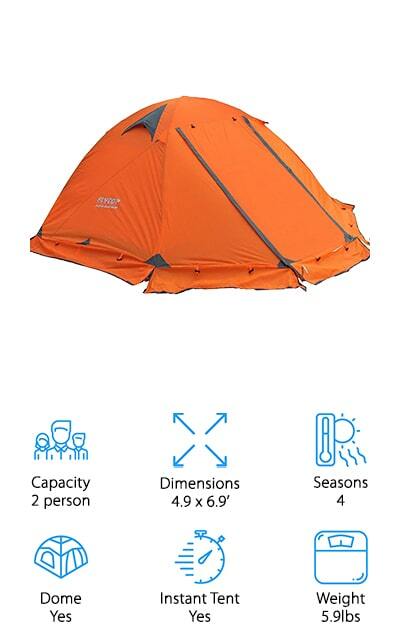 Seasons: This refers to the number of seasons where you can comfortably use the tent. A 3-season tent should be great for every season but winter, and 2-season tents are usually only for spring and summer. When will you be camping? Dome: The dome shape allows water to fall off of the tent, rather than pooling at the top. They are a simpler design, but will definitely help when it starts raining. We’ll let you know if the tent has a dome. Instant Tent: Instant tents are ones that can be set up fairly quickly. Some tents on our list can be set up in 10 minutes or less, while others take a little more time to get right. We’ll give you a heads-up. Weight: How much does the tent weigh? This is important for backpackers or hikers that are going to be taking their tent with them on the trail. For family car-camping trips, it won’t matter so much if your tent is heavy. With that information out of the way, it’s time to get to our tents! We’ve done a ton of research and review in order to bring you the best waterproof tents on the market right now. We’ve included tents with a ton of different capacities and weights and some tents that you can use no matter the season. There’s sure to be one that’s just right for your next waterlogged camping or hiking trip. Stay dry! The NTK Laredo is our pick for the best waterproof tent. If you have a big family, this is the tent that will serve you the best. It can fit about 8 or 9 people in sleeping bags, or two queen-sized air mattresses and a twin. Keep your entire family comfortable with this large, dome-shaped tent. You don’t have to worry about getting wet if it starts to rain, because all of the seams on the rainfly and tent itself are heat-welded and sealed. It’s laminated polyester with a waterproof coating so the rain runs right off. Invest in this tent for all of your spring, summer, and fall camping needs! Inside, there’s a micro net fabric to keep mosquitos away, and on sunny days you can take the rainfly off for a nice, open breeze. All of the poles are made of flexible fiberglass connected by elastic on the inside, so it can hold up to the wind as well! If you’re looking for a great tent on a budget, check out the best cheap waterproof tent on our list! Coleman is a great company that makes just about everything outdoors at great prices, so they’re worth looking at for your other gear needs as well. 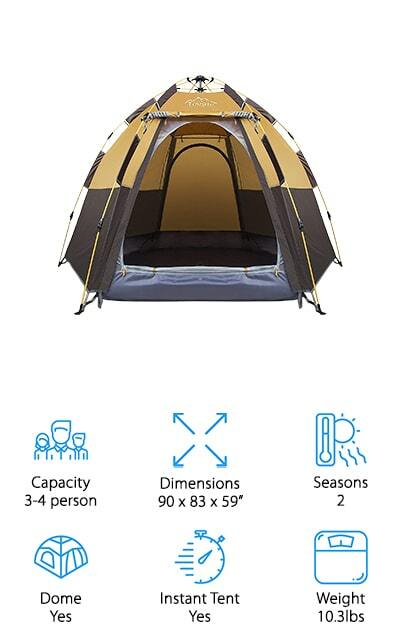 This tent fits about four people, so you can fit a queen mattress inside with a little room left on either side. It has large windows on top and a ground vent so you get all the airflow that you need. The floor is a tarp-like material, and all seams are inverted. The ones closest to the ground or on the dome are sealed, so you’re going to stay dry in the downpour. It sets up in as little as 10 minutes and comes with durable redesigned poles to keep you safe from the wind as well as water. The zipper cuff on the outside of the door even keeps water from seeping in. The Core 9 is another great family tent that can comfortably fit 9 adults in sleeping bags. That translates to 3 queen-sized air mattresses. The center height is about 72 inches, so most people will be able to stand up comfortably to change clothes and stretch out. The dome comes with a gear loft and lantern hook for added convenience, as well as organization pockets around the outside of the tent. It features a ground vent for warming weather, as well as an electronic access point so you can run an extension cord inside. Where this tent really shines is in the waterproof aspects. It’s made of durable 68D polyester. All of the seams are heat-sealed and taped, from the rainfly all the way down to the tub. No water will get into this tent no matter how hard it’s pouring outside. The dome shape allows water to run right off rather than pooling. It’ll stand up to wind, too! WEANAS makes the first backpacking tent on our list. 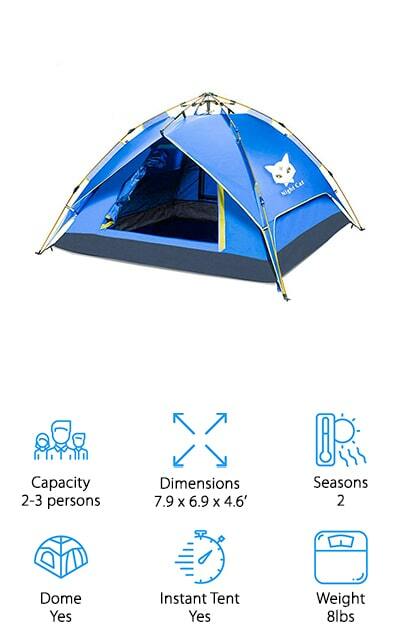 This tent is suitable for one adult on a hiking or backpacking adventure, or you can get it for the kids in your family. 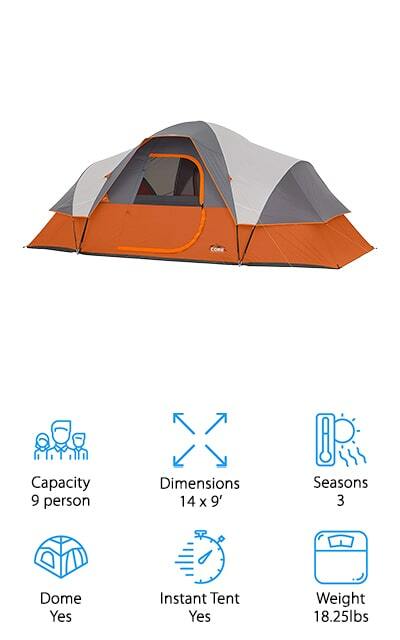 It’s taller than most other 1-person tents, so you can easily change clothes without laying down. That’s a great perk. There are two heavy-duty poles made of aluminum alloy, so they are durable and flexible even in the wind. The rainfly is completely waterproof, with fully taped seams and plenty of guy-lines to make sure your tent is covered and stable. There are even skylight vents to keep it cool on the inside while it’s warm outside. On the inside, mesh walls go right down to the tub, so you get great airflow even with the rainfly on. There are two interior pockets for gear organization. And the best thing for backpackers? It only weighs about 4 pounds. It won’t weigh you down on the trail! Night cat makes one of the best budget waterproof tents that we could find. This tent has the unique feature of being hydraulic, which means that you can set it up by yourself for the most part, with no additional help. It also means that it pops up extremely quickly, and can put away just as quickly. The poles are made of fiberglass on the automatic skeleton. All of the seams are taped on both the tent and the rainfly. You can easily fit a Queen sized mattress inside, with room for gear. The floor fabric is abrasion-proof and the tent is made of durable Oxford cloth. There is a door on each side of the tent, for both access and ventilation purposes. It’s stable in the wind and can withstand light rainstorms, so it makes a great weekend camper for spring and summer. And the mesh interior keeps mosquitos out so everyone is comfortable! This Pop-Up Tent by Toogh is a dome with a unique design. Instead of having four poles and making a sort of rounded square with four sides, this tent is a hexagon. There are six dome poles and extra space at the sides for gear. 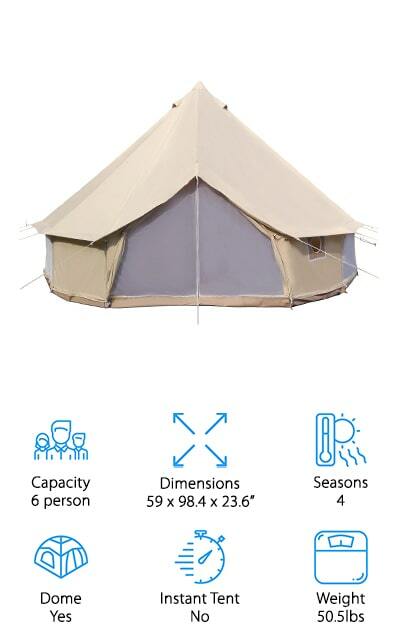 It’s the perfect spring and summer tent for families, as the ideal occupancy is 2 adults and 2 children. It’s 10 pounds, so it is lightweight enough to take for a few backpacking friends. Like some of the previous tents on our list, these fiberglass poles also come with a hydraulic system, so the tent almost sets itself up instantly. It comes with a rainfly and all of the proper stakes and guy-lines to make sure that you won’t get rained on, and that the tent can withstand the wind. 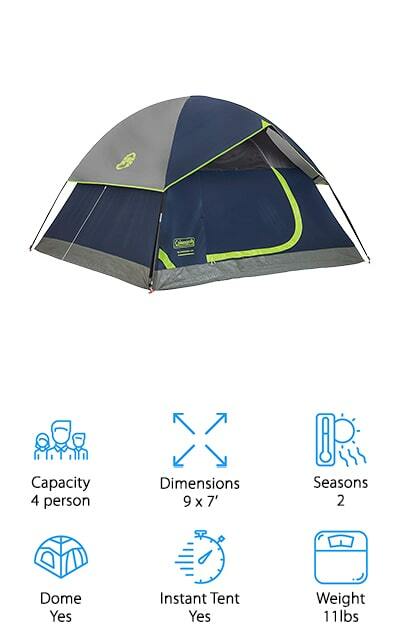 Because of the hexagon design, the peak of the tent is about 5’5”, so shorter people can stand up to change. That’s a neat perk. This backpacking tent by Clostnature is a great tent for someone who wants to go backpacking with no previous experience. 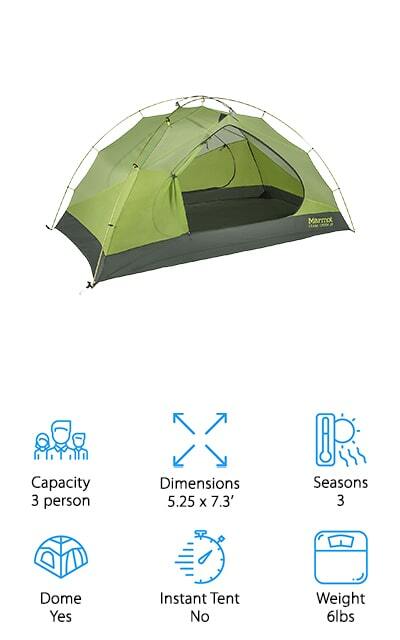 You can comfortably fit two people in this tent, and it only weighs about 5 pounds. In fact, if you have a large dog that’s going with you, it’s going to be roomy enough for both of you. It’s easy to set up by one person and comes with two aluminum poles that are free-standing and will hold up to wind and rain. The interior has entirely mesh walls for great airflow, and the rainfly is coated with waterproof material. All seams are factory sealed and taped, and it’s comfortable in every season but cold winters. Plus, it comes with an emergency pole repair kit, which is a great feature that not many tents take into account. There are two doors, and each door has its own vestibule for gear and shoes. You’re going to love this lightweight tent. For more luxurious camping arrangements, go with the Yurt Bell Tent by Dream House. There are multiple sizes to choose from, all tied to the yurt’s diameter. For the 4-meter diameter tent, you can easily fit a queen-sized mattress as well as two twins. It’s great for the whole family! This is a four-season tent because it has a ventilation duct for a stove pipe. You can get a camping stove to fit inside the tent and keep it nice and warm in the colder months. The cotton canvas exterior is waterproof for light rain, and it comes with a rain tarp that will keep out even the heaviest downpours. When it’s hot, roll the sides of the tent up for more airflow. There’s enough room inside this tent for all of your gear and all of the extras you need for a more involved camping trip, or for gear for your family. It even has ground vents for air flow! This freestanding tent by Flytop is one of the best waterproof tents for camping that we found. It’s great for four seasons, though we recommend for the sake of comfort avoiding camping when it’s too cold. Still, this tent will keep you dry and out of the elements if that’s something that you want to do. There are two entrances so you don’t have to crawl over your tent partner to get outside. Plus, they provide excellent ventilation for warmer days. It’s an extremely lightweight tent that you can take on your backpacking trips and for long through-hikes because it only weighs about 6 pounds. For two people, that’s pretty light. Even if you just have a large dog, this tent will come in handy with plenty of space for both of you. The mesh wall panels keep bugs out and help keep heat in, and the rainfly has plenty of guy-out points. It’s great for windy days! If you’re going on a backpacking trip or a through-hike with a partner, this is the tent you’re going to want to get. The maximum weight (with all components, just in case) is 6 pounds. You can easily split this between two people if that’s too much for one to carry on their own. Inside is 42 square feet of waterproof shelter that will hold up to the elements. You can open both D-shaped doors to ventilation, or keep them closed with the rainfly closed to keep heat in when it drops off at night. The poles are heavy-duty aluminum, and there are two overhead vestibules under the rainfly for all the gear you can’t fit inside. It’s the best 3-person waterproof tent that we found during our research. It’s great for car camping as well, and you’re going to love how warm and cozy it keeps you. The bottom is extremely durable, so a footprint is optional.